Happy August! Hard to believe there’s only a month left of summer then it’s back to the races. I hope you’re indulging in your favorite joys of the season. 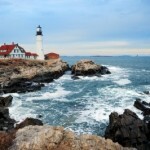 This week, my son and I head up to the coast of Maine for a three-week vacation with my family; hopefully we’ll make a dent on our summer bucket list items! In the E-Myth, Michael Gerber teaches that “the difference between great people and everyone else is that great people create their lives actively, while everyone else is created by their lives, passively waiting to see where life takes them next.” For me, the cool breezes and fresh, salty water are two great ways to clear my head and reflect on all that I want to create in my own life. In addition to lobstering and eating lots of blueberry ice cream, I plan to intentionally set aside some creative time for innovating and working ON my business. This part of my work has become one of my most favorite activities related to running the business, an indulgence if you will. Perhaps it’s the positive reinforcement of consistently seeing the ideas I’ve conceptualized in my head develop into tangible reality. There’s no better high than to re-connect with the passion you have for your work, your business, your team and the people you serve. Wishing you a beautiful, happy, indulgent August filled with all the things you love!